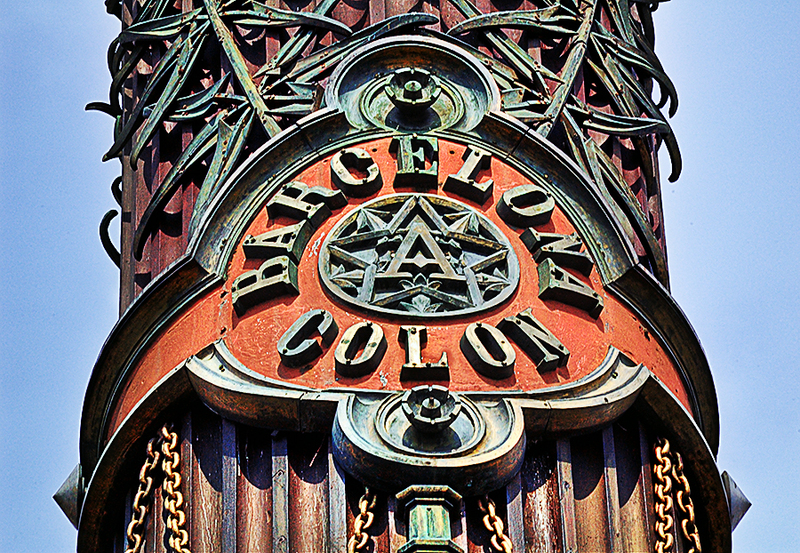 Today, a close look on the column and pedestal of the Christopher Columbus monument at the end of Las Ramblas. Did you know that inside this column there is a lift, a very narrow one, that takes visitors to the top? This detail in the image which looks like a cigar ring to me can be appreciated here but if you really want to feel the place click and drag inside the embedded Google street view map of the roundabout where the monument is, facing Barcelona harbor. To get some information and take a look at the bronze lions at the base, go here. Qué maravilla. Esta foto tiene todo el misterio y el color de Barcelona. Great details and colors here, nice picture! Bien visto, si habré pasado veces por delante y nunca me he fijado en ese detalle!! Gracias Nuria. He visto también el comentario en Flickr. Tienes razón, los detalles se nos escapan. Si no es porque me acerco con la cámara te juro que no sabría ni como es. Sabes que está pero no lo miras.